THESE EARRINGS ARE SO VERY PRETTY AND ARE SO UNUSUAL! 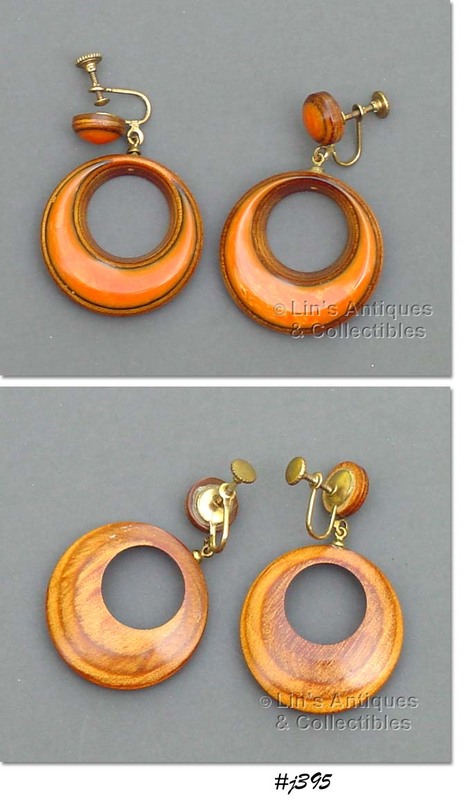 THEY’RE SCREW-BACK STYLE AND THEY HAVE A CIRCULAR SHAPED DANGLE (1 3/8” DIAMETER) MADE OF BEAUTIFULLY GRAINED WOOD WITH ORANGE COLOR BAKELITE. GORGEOUS, EYE-CATCHING EARRINGS! THESE EARRINGS ARE SO NEAT! ONE PAIR HAS TINY SHELLS, MEASURES 1 1/16” DIAMETER, AND HAS CLIP BACK STYLING. THE OTHER PAIR HAS A STAR AND A LEAF (?) AND IS OVAL SHAPED WITH SCREW-BACK STYLING. EYE-CATCHING EARRINGS! 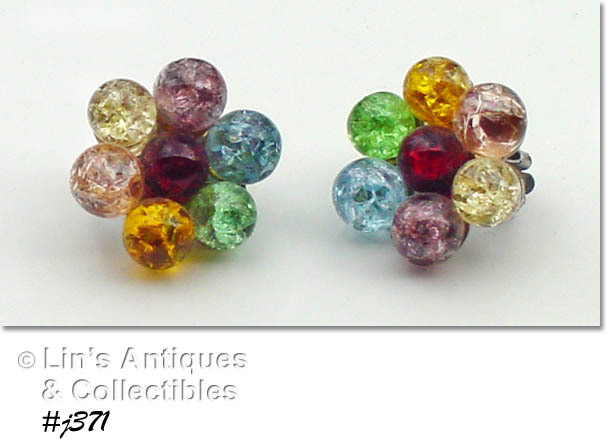 THERE ARE 2 PAIRS OF LOVELY CONFETTI LUCITE EARRINGS IN THIS LISTING! 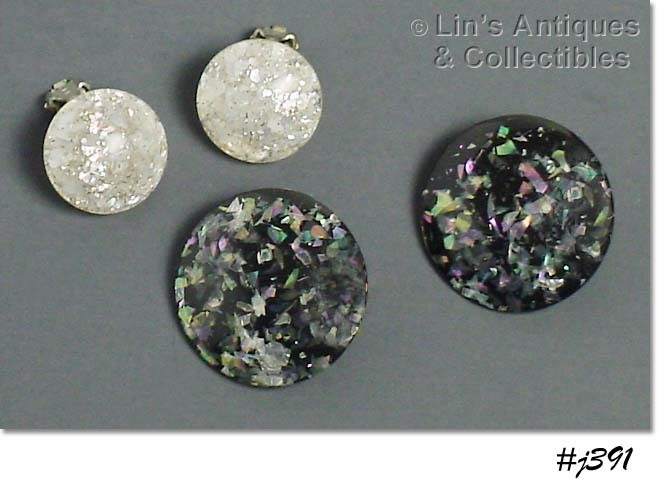 ONE PAIR IS BLACK WITH SILVERY, VERY LIGHT REFLECTIVE CONFETTI, MEASURE 1 3/8” DIAMETER, AND ARE CLIP BACK STYLE. THE OTHER PAIR HAS CONFETTI HAT REMINDS ME OF AURORA BOREALIS RHINESTONES IN THAT THEY HAVE SO MANY DIFFERENT COLORS DEPENDING ON THE LIGHT ANGLE! THEY MEASURE ¾” DIAMETER AND ARE ALSO CLIP BACK STYLE. SUPER! 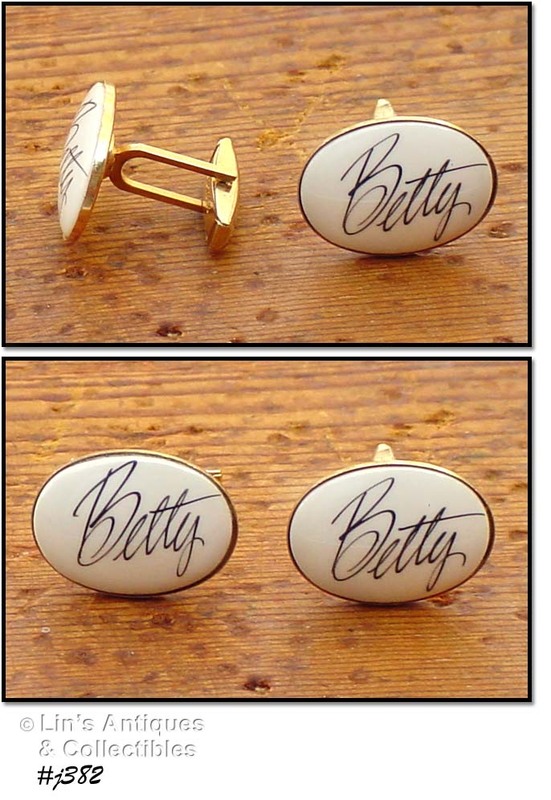 VERY PRETTY CUFFLINKS FOR “BETTY”! THEY’RE GOLD-TONE AND HAVE PAT. 2472858. UNUSUAL ITEM! I FOUND THE PRODUCTION INFORMATION FOR THIS ITEM IN A DECEMBER 2008 EDITION OF COUNTRY LIVING IN THE "WHAT IS IT? WHAT IS IT WORTH?" SECTION. THE VALUE PLACED ON A BLUE COLOR NECKLACE -- NO BRACELET -- WAS $130.00 (IN 2008!). ANOTHER BEAUTIFUL PAIR OF EARRINGS! THEY ARE ROUND SHAPED – REMIND ME OF A FLOWER -- AND THEY ARE CRACKLE GLASS. MEASURE 1” DIAMETER AND ARE IN EXCELLENT CONDITION. GORGEOUS AND VERY DIFFERENT! 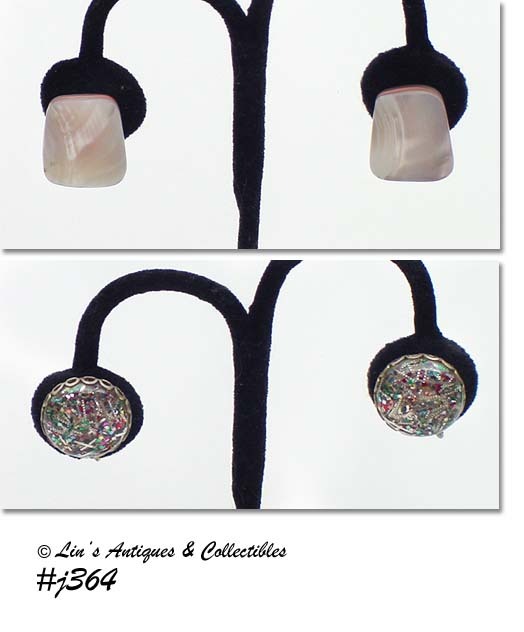 THIS LISTING HAS ANOTHER PAIR OF BEAUTIFUL CLIP EARRINGS FROM MY COLLECTION! 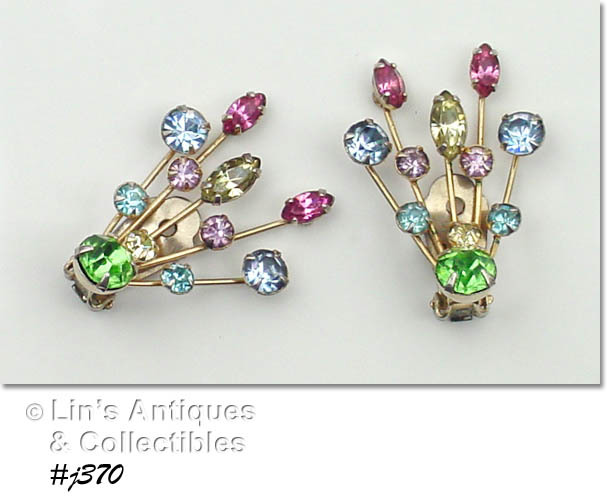 THEY HAVE BLUE, PINK, CLEAR, AND GREEN COLOR RHINESTONES (ALL ARE PRONG SET), MEASURE 1 ¼” LONG (AT LONGEST), 1 1/8” WIDE (AT WIDEST). THESE EARRINGS ARE GORGEOUS AS EVIDENCED IN PHOTO BUT THEY REALLY “POP” WHEN WORN – THEY ARE ABSOLUTELY EYE-CATCHING! 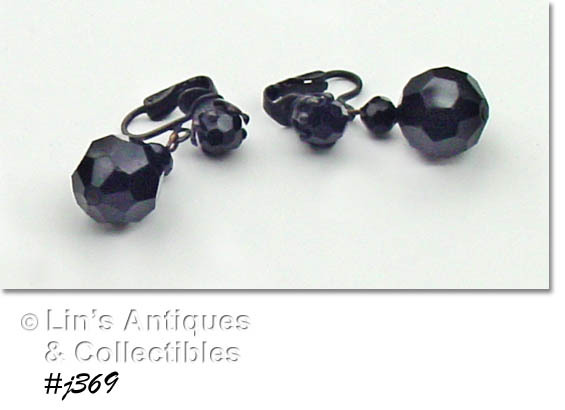 THIS LISTING HAS ANOTHER PAIR OF BEAUTIFUL BLACK GLASS EARRINGS! THEY ARE CLIP STYLE AND MEASURE 1 ¼” LONG. THE GLASS BEADS ARE FACETED FOR LOTS OF LIGHT REFLECTION. THE STYLING IS SIMPLE AND ELEGANT. THESE CLIP STYLE EARRINGS ARE SO PRETTY! 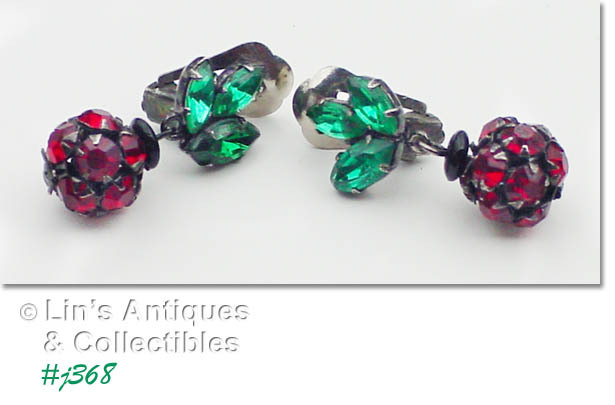 THEY HAVE 3 GREEN RHINESTONE “LEAVES” WITH A ROUND SHAPED DANGLE THAT IS COVERED WITH RED RHINESTONES (RESEMBLES A CHERRY OR A BERRY). ALL RHINESTONES ARE PRONG SET, EARRINGS MEASURE 1 ¼” LONG AND ARE MARKED AUSTRIA. SUPER NICE! 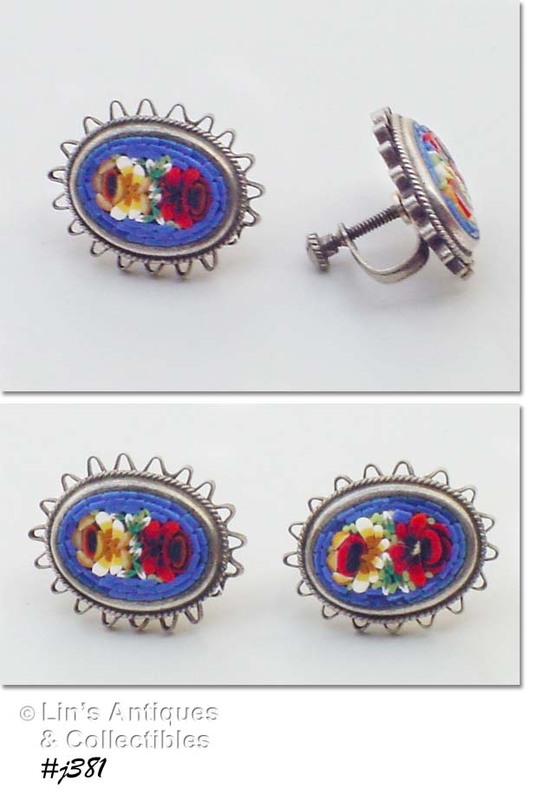 THIS LISTING HAS 2 PAIRS OF LOVELY CLIP-BACK EARRINGS! ONE PAIR IS CONFETTI LUCITE AND THE OTHER APPEARS TO BE SHELL (PERHAPS MOTHER OF PEARL). THEY HAVE A CENTER SECTION OF PINK COLOR SANDWICHED BETWEEN THE TWO WHITE SHELL LAYERS – UNUSUAL AND VERY PRETTY. THEY MEASURE ¾” X ¾”. THE ROUND SHAPED LUCITE “CONFETTI” EARRINGS MEASURE ¾” DIAMETER. BOTH PAIRS ARE SUPER! THIS LISTING HAS A VERY PRETTY PIN MADE OF WOOD! 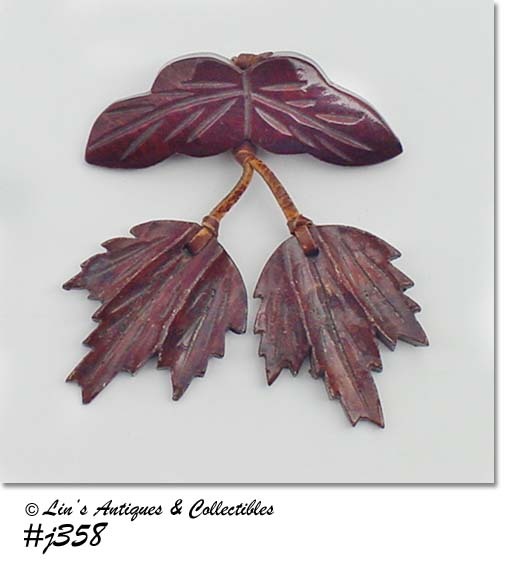 PIN AND THE TWO LEAVES THAT DANGLE FROM LEATHER STRIPS HAVE VERY NICE CARVING. 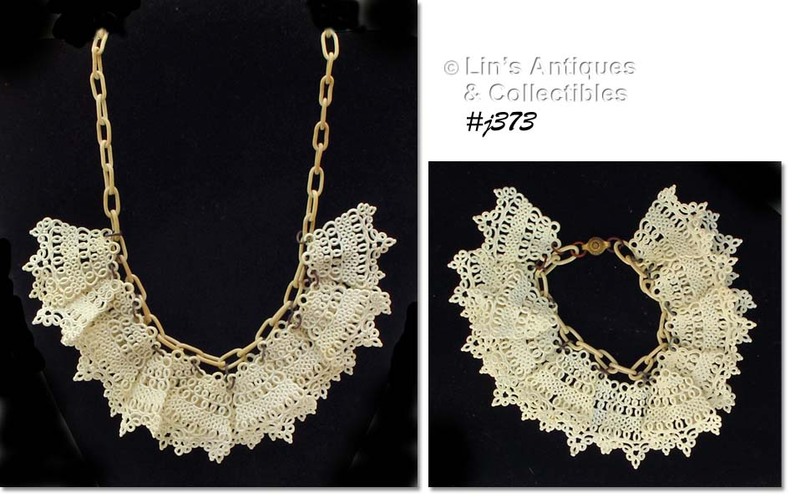 LOVELY WORN AT THE THROAT OF A HIGH NECK BLOUSE, ON A JACKET OR COAT LAPEL, OR PINNED TO A VINTAGE HAT! NEAT RETRO BOLO WITH INITIAL “S” SLIDE! THE SLIDE IS MARKED SWANK. ISN’T THIS A SUPER RETRO ITEM? 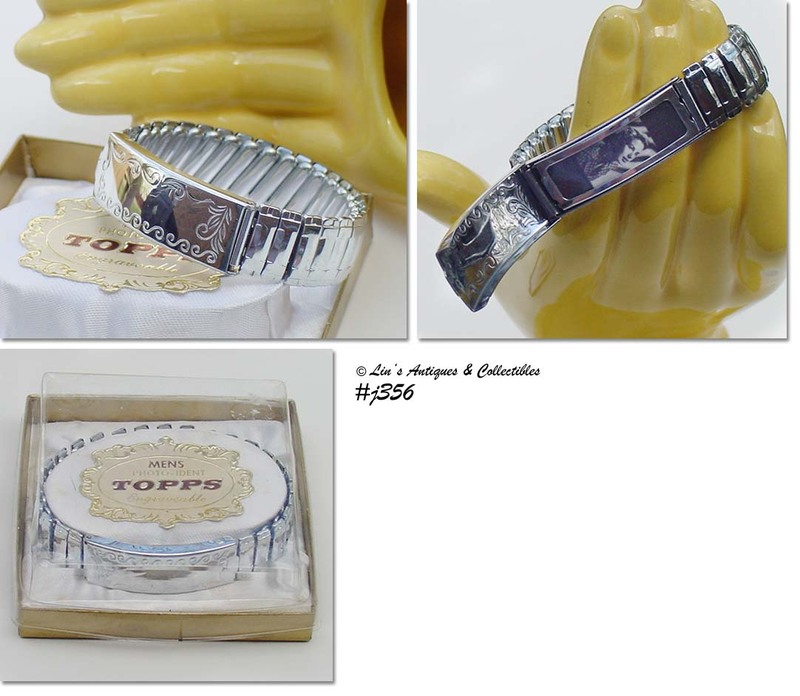 IT’S A TOPPS MAN’S PHOTO ID ENGRAVEABLE BRACELET AND IS STILL IN THE ORIGINAL BOX! I’VE GROUPED THESE SUPER NEAT MEN’S ACCESSORIES INTO ONE LISTING! THERE ARE 7 PAIRS OF CUFFLINKS, 2 TIE TACKS, AND 3 TIE CLIPS. THE CUFFLINKS WITH THE HORSES ARE MARKED SWANK, THE BRUSHED GOLD COLOR ARE MARKED 10 KRGP, AND THE ORDER OF ELK ONES ARE GOLD FILLED. THE “FATHER’S” TIE CLIP IS GOLD FILLED AND THE ONE WITH RED CABOCHON IS MARKED ANSON. VERY NICE ITEMS! THESE TWO “MEMORY” BRACELETS HAVE BEEN IN MY JEWELRY COLLECTION FOR MANY YEARS! THEY ARE REFERRED TO AS MEMORY BRACELETS BECAUSE THE BEADS ARE ON A THIN FLEXIBLE WIRE – YOU WIND THEM ONTO YOUR WRIST AND THEY RETURN TO THEIR ORIGINAL SHAPE WHEN YOU “UNWIND” THEM TO REMOVE! 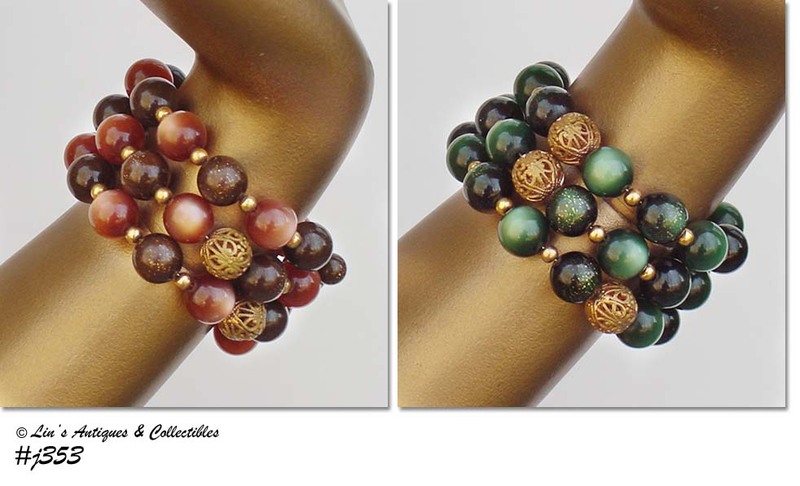 BOTH BRACELETS ARE IN EXCELLENT CONDITION – I NOTICED THE BROWN ONE IS MISSING ONE OF THE END DANGLE BEADS – THAT’S IT! 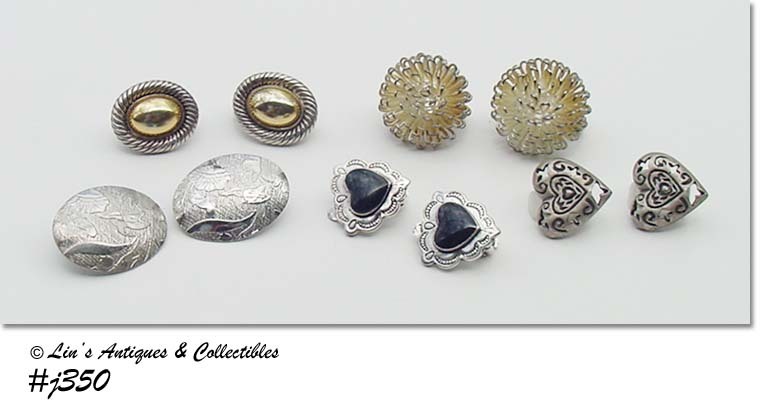 I’VE GROUPED THESE 5 PAIRS OF CLIP BACK EARRINGS INTO ONE LISTING BECAUSE THEY’RE ALL SILVER COLOR – POSSIBLY SOME STERLING BUT ARE NOT MARKED! THE HEARTS WITH BLACK HEART CENTERS ARE VERY PRETTY, THE CUTOUT HEARTS ARE PROBABLY PEWTER, THE OVAL SHAPE WITH GOLD TONE CENTERS ARE GREAT WITH JEANS OR TO THE OFFICE, THE LARGER OVAL EARRINGS ARE LIGHT WEIGHT AND HAVE A LOVELY DESIGN OF DIFFERENT SHAPED LEAVES, AND THE LAST ONES ARE MY FAVORITES – THEY REMIND ME OF SEA URCHINS (I BELIEVE THEY’RE STERLING BUT I COULDN’T FIND ANY MARKINGS). THESE ARE ALL LOVELY AND ARE AFFORDABLY PRICED! THESE CUFFLINKS ARE SO NEAT! 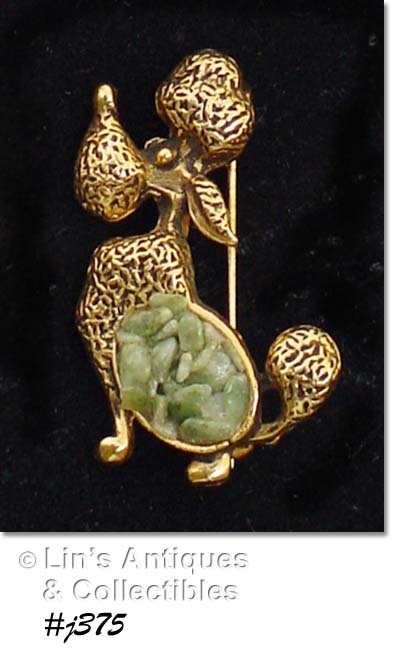 EACH HAS A CAT (FULL FIGURE) WITH GREEN RHINESTONE EYES – CATS EVEN HAVE WHISKERS! 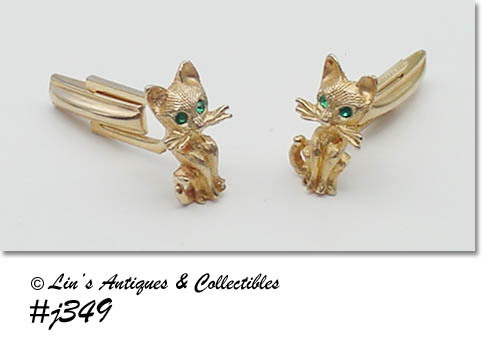 CUFFLINKS ARE GOLD TONE, CATS ARE ¾” TALL AND ½” WIDE (AT WIDEST). EYE-CATCHING! THESE LOVELY PINS ARE PERFECT GIFTS FOR A SPECIAL GOLFER! 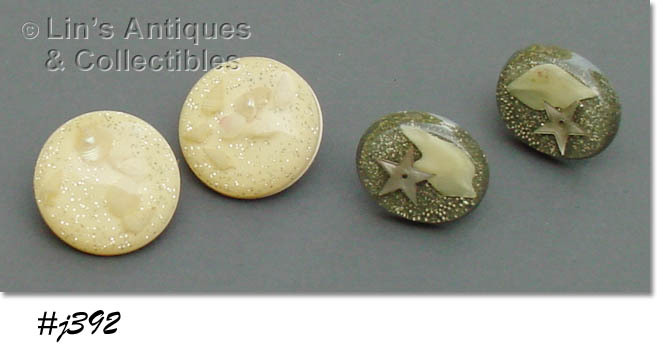 ALTHOUGH THEY ARE UNMARKED, BOTH PINS HAVE QUALITY WORKMANSHIP AND MATERIALS. ALL RHINESTONES ARE SPARKLY AND PRONG SET. THE GOLF BAG PIN MEASURES 1 5/8” LONG AND THE GOLF CLUB PIN IS 2” LONG. VERY NICE!